Last weekend found me in Seattle for a friend’s wedding. Weather forecast: Rain. As usual. While there, I accidentally stumbled upon something amazing: the brand-new Amazon Books bookstore! Little did I know, the store had opened up just over a month earlier, representing Amazon’s new experiment in brick-and-mortar book sales. –All titles are displayed face-out. This means a smaller inventory, but it also means you’re much more likely to stumble upon a new read you didn’t know you needed in your life. Face-out titles=easier discovery of new books=more love matches made between books and readers. –All titles are listed with a plaque featuring a review from Amazon.com–so you can basically ask another real human being, “How was this book?” and they’ll tell you. No filtering through publishers, professional review companies, etc. Just real people telling it like it is. –No fixed prices are listed on the shelves. Instead, the bookstore has price-scanning machines. The price of the book is whatever it’s selling for on Amazon that day (usually a significant discount from the list price). Discounted books=yay! –Best of all: Amazon Books stocks top-selling books from Amazon.com, regardless of whether they’re traditionally or independently published. That means readers, not publishers, are deciding what gets displayed and sold in this bookstore. Amazon’s Createspace and Kindle platforms have already democratized publishing; now Amazon Books is democratizing the bookselling supply chain as well. As an independently published author, I personally think that’s fantastic–not only for me, but for readers who get to see more of the books they want on the shelves. Amazon sometimes gets a bad rap for being a big company, and a big company it is. I sincerely hope the success of this new bookstore doesn’t come at the expense of smaller, independent bookstores. However, Amazon’s existence also nurtures the success of other little guys, like small presses and independently published authors. It gives us a platform from which to send out our voices. And more voices in the book arena=more ideas and stories circulating=happier and better informed readers=hopefully more understanding and compassion in the world. I’d call that a win-win. So did I come home with a book from this bookstore? Why yes, I did. For some time I’ve been wanting to read the bestselling I Am Malala, memoir of the youngest-ever Nobel Peace Prize winner, and I found it at Amazon Books (for less than $10). Malala’s story of courage is truly inspiring. 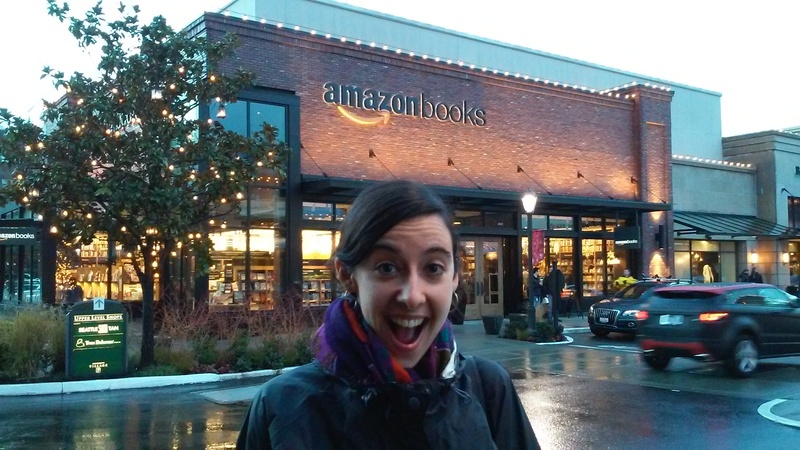 What do you think of Amazon’s new bookselling experiment? 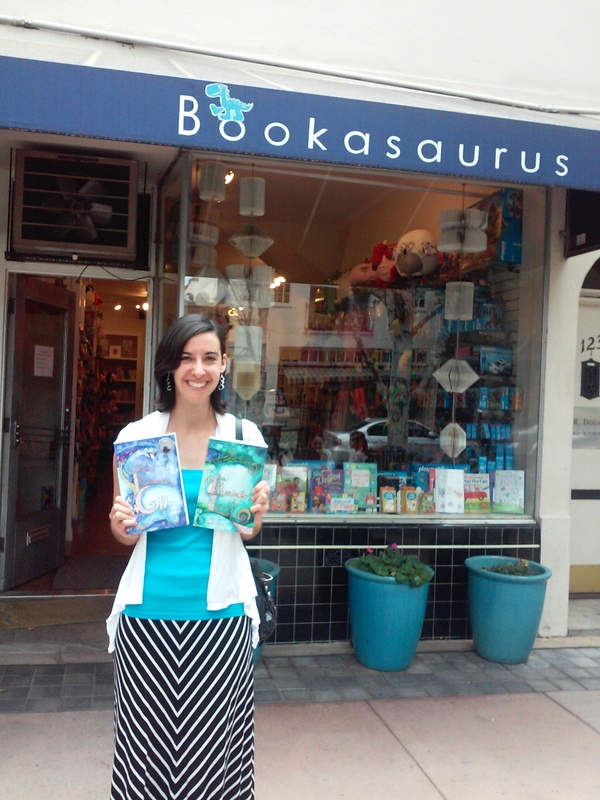 I’m thrilled to partner with Bookasaurus, the children’s division of Leigh’s Favorite Books, in Sunnyvale. 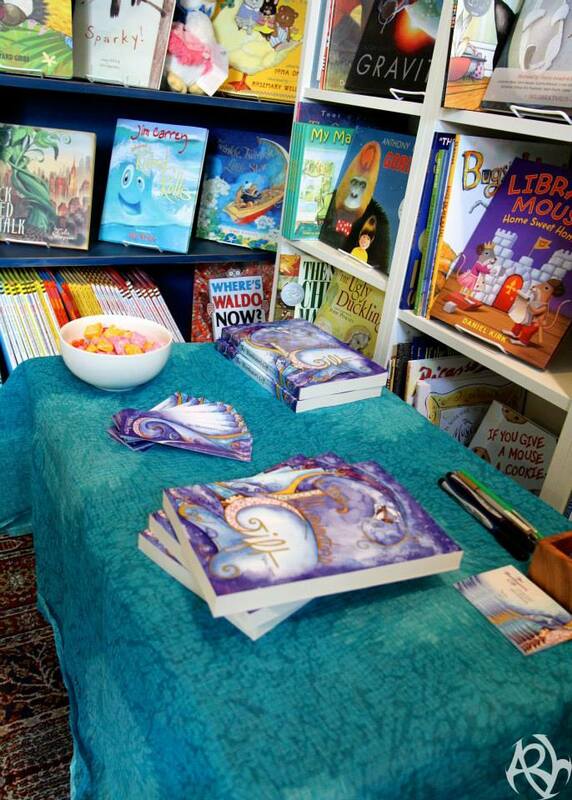 This charming independent book/toy shop is a paradise for the young and young at heart. A fixture of the community, Bookasaurus now carries both The Illuminator’s Gift and The Illuminator’s Test. And the manager, Heather, is a real-life adventure heroine. At just 21, she goes to school, runs a bookshop, and reads every book she stocks. 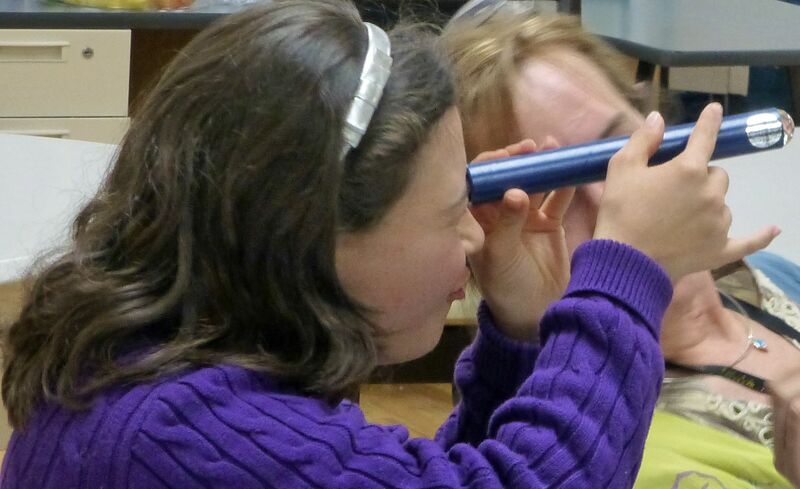 Hearing that she liked The Illuminator’s Gift was praise indeed. I want to be her when I grow up. 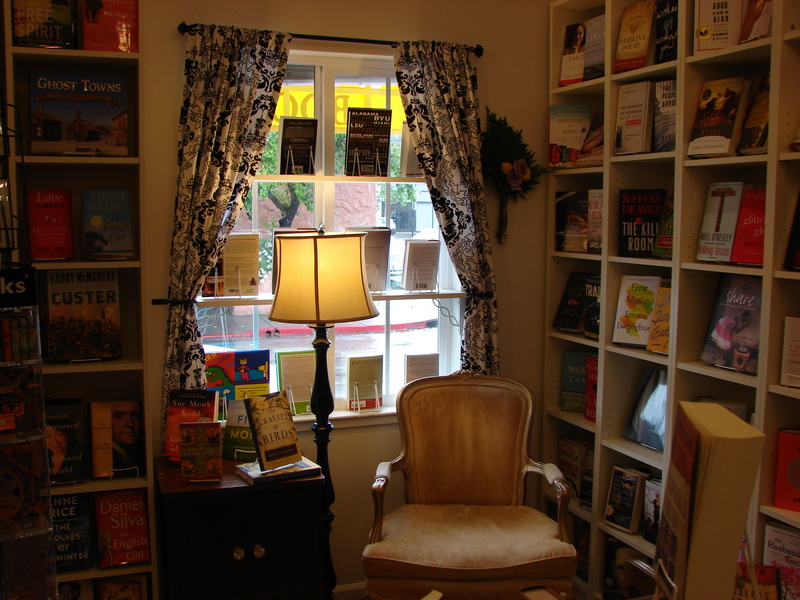 So check out this independent gem and shop local for your next book copy! The author’s language is exquisite and the detailed descriptions make the scenes come alive. The simple and elegant style of writing gives good pace and movement to the plot and the story moves forward fluidly. 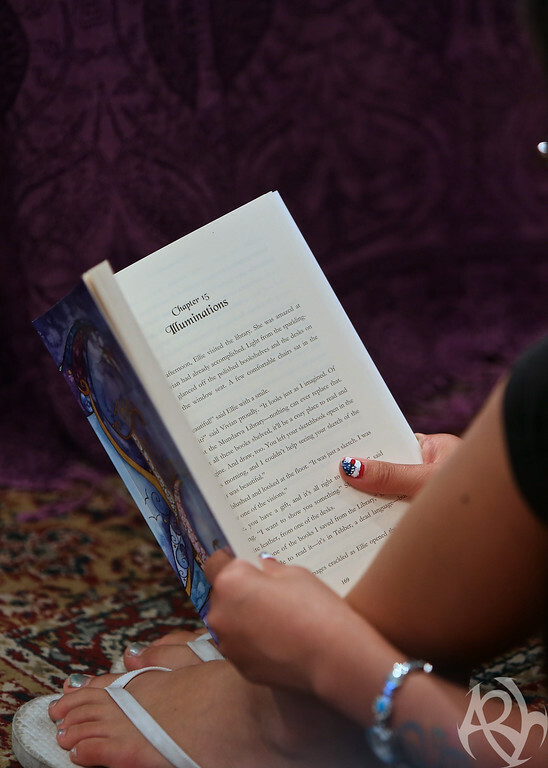 It resonates with young readers along the lines of the Harry Potter series and The Lord of the Rings with lot of adventure and whimsy that will make readers dream and imagine. Don’t know if I can really compete with Tolkien and Rowling, but I’m quite flattered anyway. Speaking of reviews, if you’ve read one or both Illuminator books, would you take a second to leave a review on Amazon? 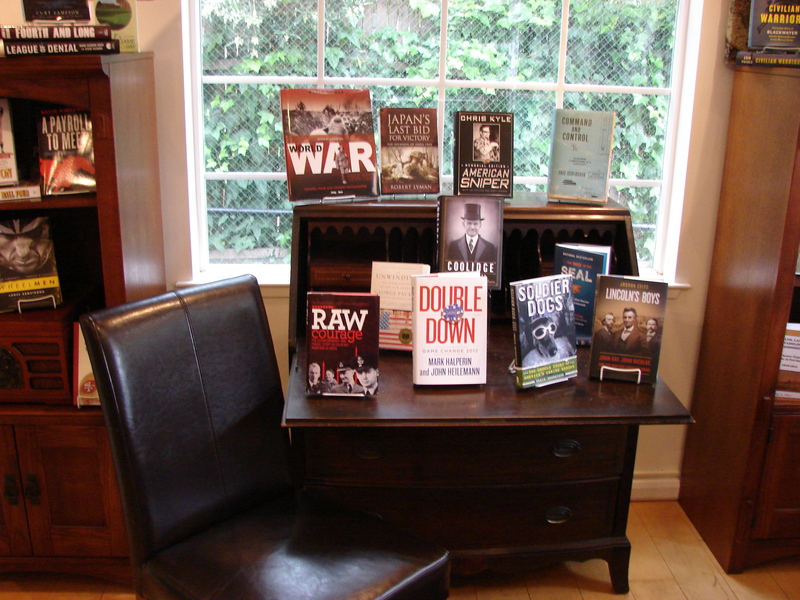 In the indie-publishing world, reviews from readers strongly influence what gets read. Many thanks! Stay tuned for more events and updates in the works! Lots of exciting updates here! Besides being my birthday month, February has been a big one for the books! First was the FANTASTIC news that Reader’s Favorite, an independent website, published a 5-star review of The Illuminator’s Gift (and gave it a shiny medal)!! I was so honored and encouraged to receive this kind of praise from a third-party source. You can read the review here. If you haven’t already left your own Amazon review of The Illuminator’s Gift and The Illuminator’s Test , I’d greatly appreciate it! 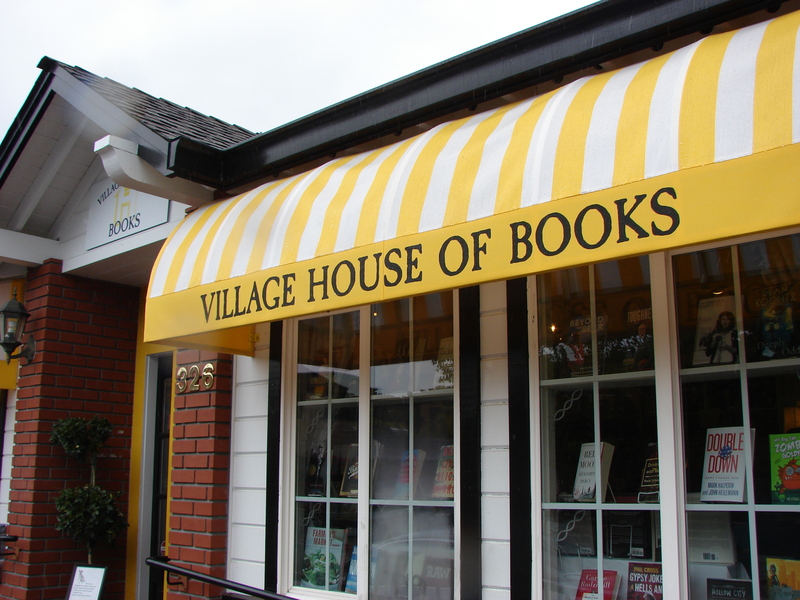 Next up: I’m pleased to announce that you can now find BOTH my books shelved at Village House of Books (Los Gatos), Spectator Books (Piedmont), and Hicklebee’s (Willow Glen)! 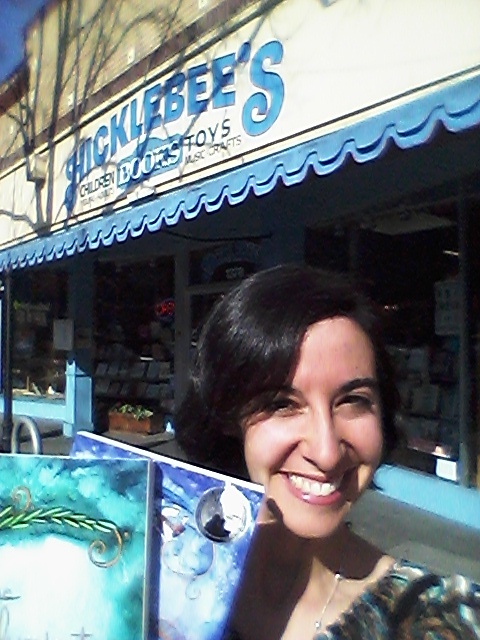 I won’t deny that I enjoy the convenience of Amazon, but if you’re looking for my books, consider doing something good for your neighborhood and picking up a copy at one of these local shops (they’re super cute on the inside, too!). Last but not least: this month I had the opportunity to be the first-ever author guest at the College of Adaptive Arts in San Jose. 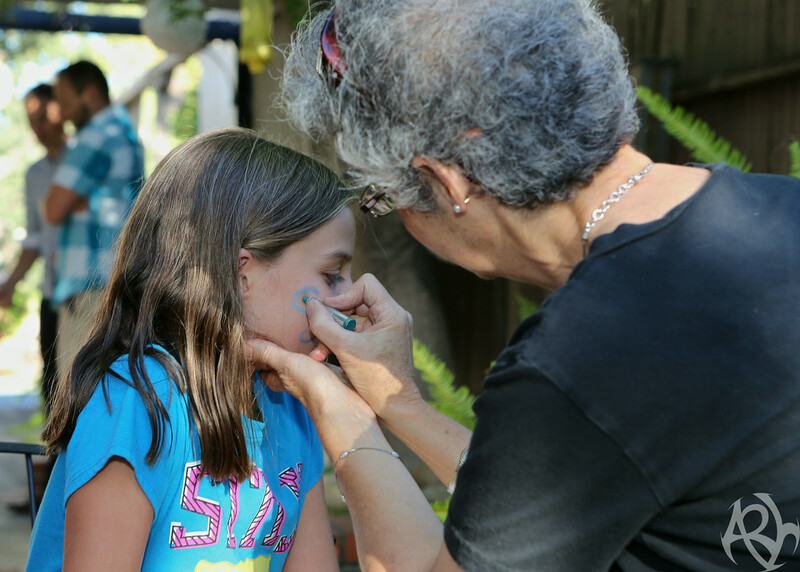 This innovative program offers adults with disabilities the opportunity to flourish by learning a variety of creative and life skills in a safe and nurturing environment. To be honest, presenting a lecture here was a stretching experience for me. Standard presentation formats all went out the window in the first five minutes. But in exchange, I got to witness the unique perspective and unlimited enthusiasm of these sweet students. They understand, perhaps more than anyone, that writing means seeing the world a little differently, like looking through a kaleidoscope. More exciting events are in the works, so keep checking back to the News & Events page for updates! To find out how to book me as a speaker at your own school, homeschool group, or event, check out the Speaking page. 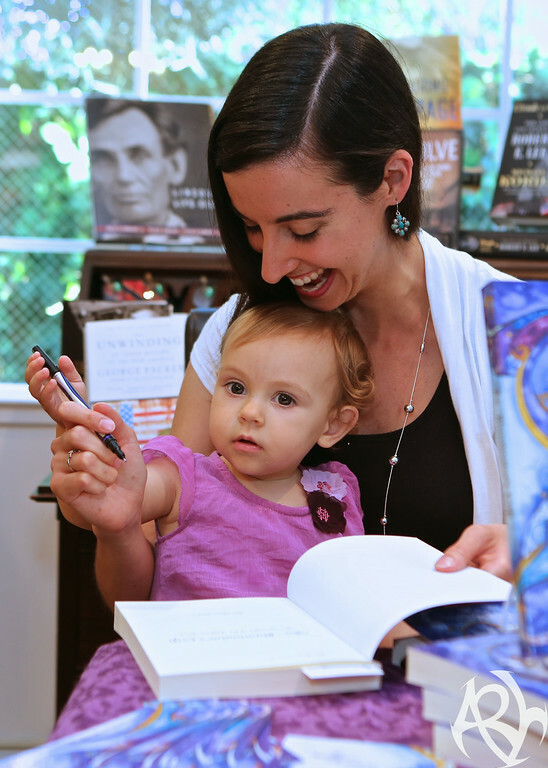 Last Saturday was California Bookstore Day–a statewide day of celebrating books and the independent shops that create warm, welcoming community spaces for them. 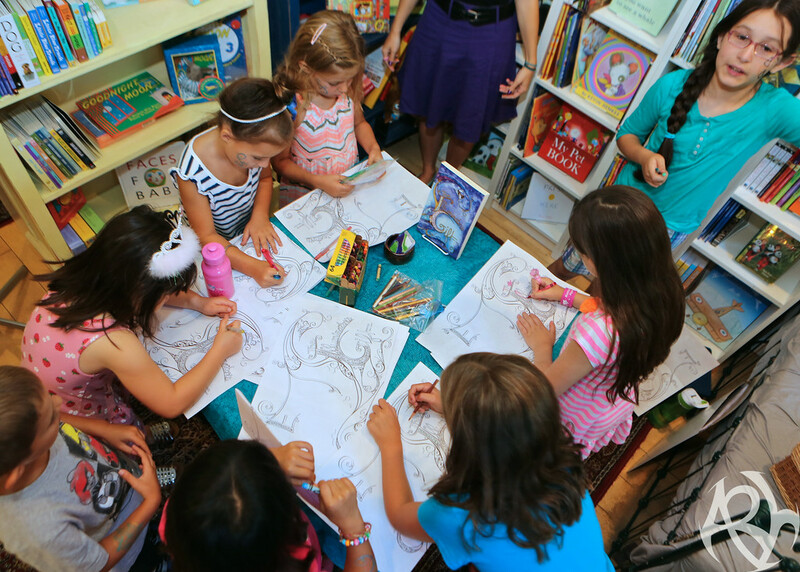 We signed copies for some brilliant young readers and got to chat about the process of writing, illustrating, and publishing a book. Not going to lie: seeing The Illuminator’s Gift on display beside a wall of books including The Giving Tree and If You Give A Mouse A Cookie was a lifelong dream come true. 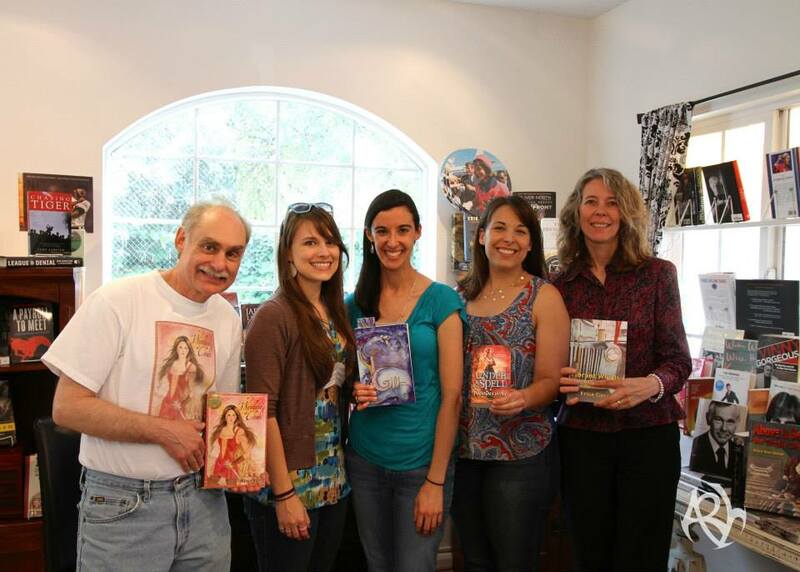 One of the highlights of the day for me was getting to meet some amazing local authors. A.R. Silverberry, author of the young adult fantasy Wyndano’s Cloak, and I became book friends as we signed copies for each other. Laughter about fan comments, incriminating book research, and mundane day jobs was interspersed with tips about contracts, cover art, and professional organizations. Though I was the youngest author there, everyone (including shop owners Steve and Cheryl Hare and author liaison Lloyd Russell) made me feel like part of a literary tribe. We’re all just trying to follow the passion that’s been placed within us (and not end up living in cardboard boxes). By the end of the day, I was exhausted, but honored to be welcomed into such a smart, quirky, fun book family. I look forward to introducing you to some of these wonderful people via blog interviews this summer! And of course, a day spent in a bookstore meant I couldn’t come home without books! 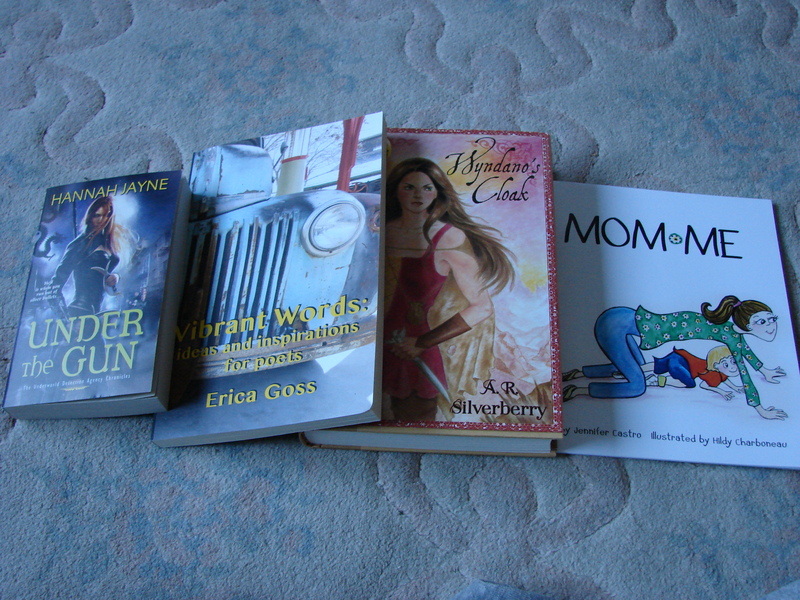 My dollars ran out before my book cravings did, but I still managed to secure copies of Hannah Jayne’s Under the Gun, Vibrant Words by Erica Goss, Wyndano’s Cloak by A.R. Silverberry, and Mom*Me by Jennifer Castro. All signed, of course. Plus a cheery yellow book bag from Village House of Books. Now I just need to find more time to read. 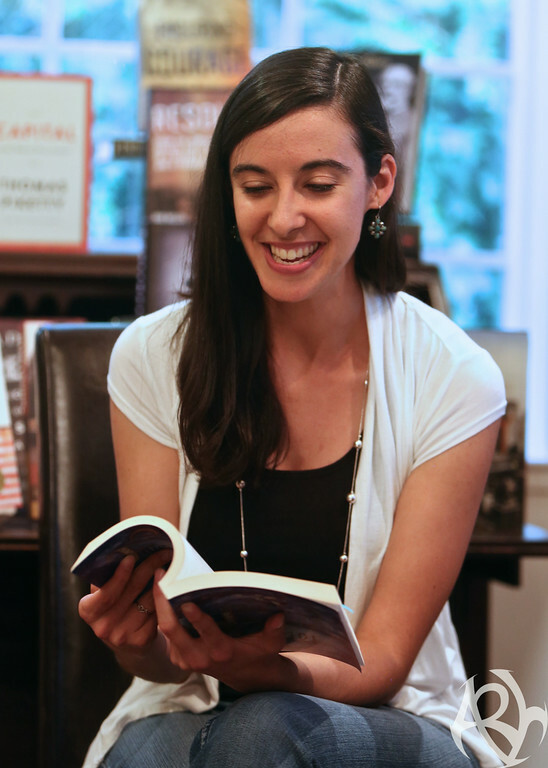 I’m THRILLED to announce that I’ll be back at Village House of Books for a TIG-specific book party this summer! More details to come, but mark your calendars for the evening of Thursday, July 10th! 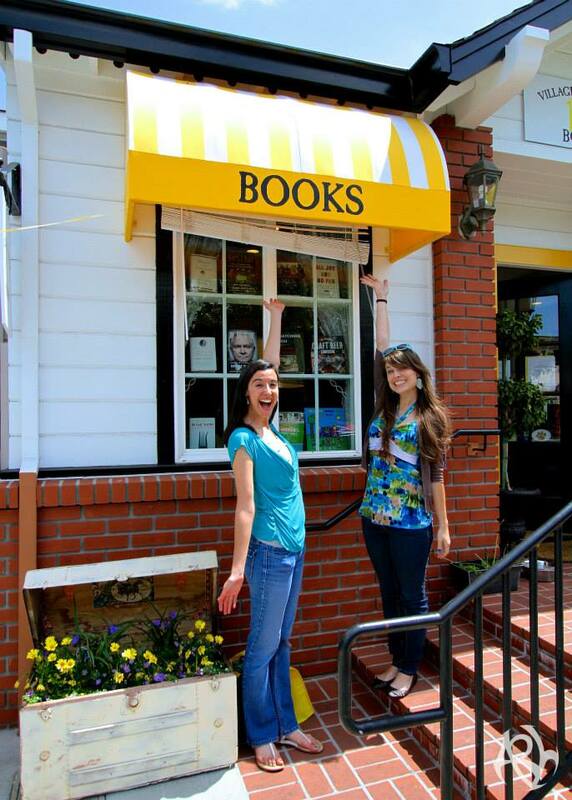 Don’t forget: tomorrow, May 3rd, is California Bookstore Day! 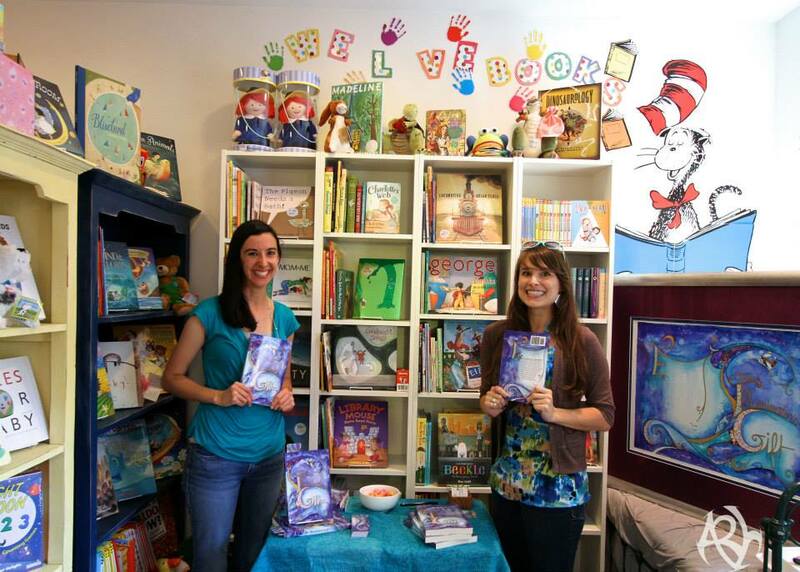 Come visit illustrator Amalia Hillmann and me from 10-12 at Village House of Books! 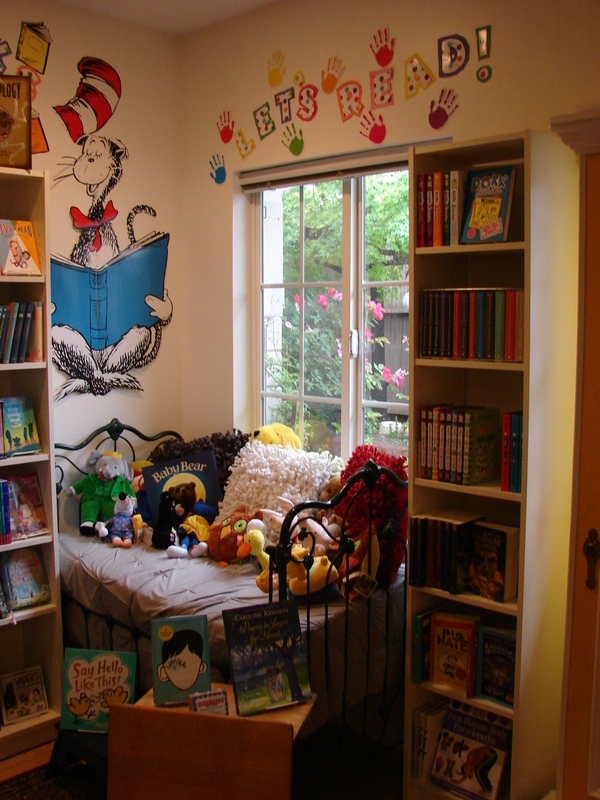 This adorable nook is located at 326 Village Lane, Los Gatos 95030. Free parking can be found off Bachman Avenue. 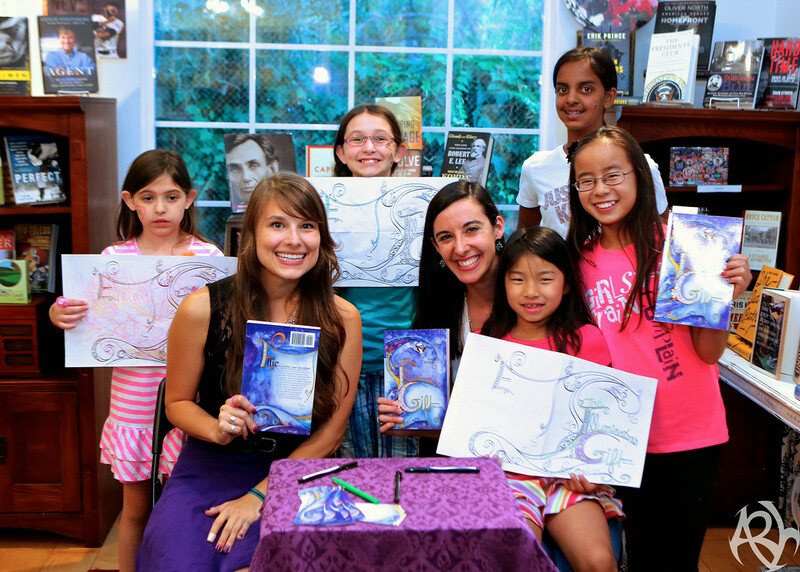 There will be book signings, food, balloons for the kids, and a chance to see the original Illuminator’s Gift artwork! It’s also a great chance to show support for a local independent bookshop. Downtown Los Gatos is a fun and walkable community, so stop by VHB, then keep wandering! 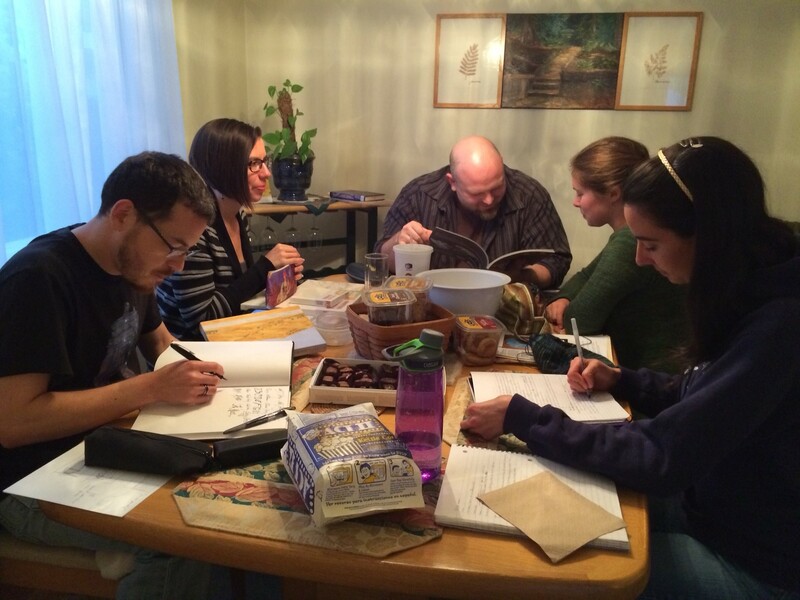 A day of writers + artists + independent booksellers will = a lot of creativity. Especially not a creative man or woman. Much of creative work is solitary in nature–writing, painting, sculpting, knitting, composing. I actually really enjoy this aspect. Too much time with people can wear me out. But not enough can wear me out, too. I’ve lately been encouraged by meeting with a few other creative friends. Last Friday we got together for dinner and a chance to collectively discuss/pursue our endeavors. 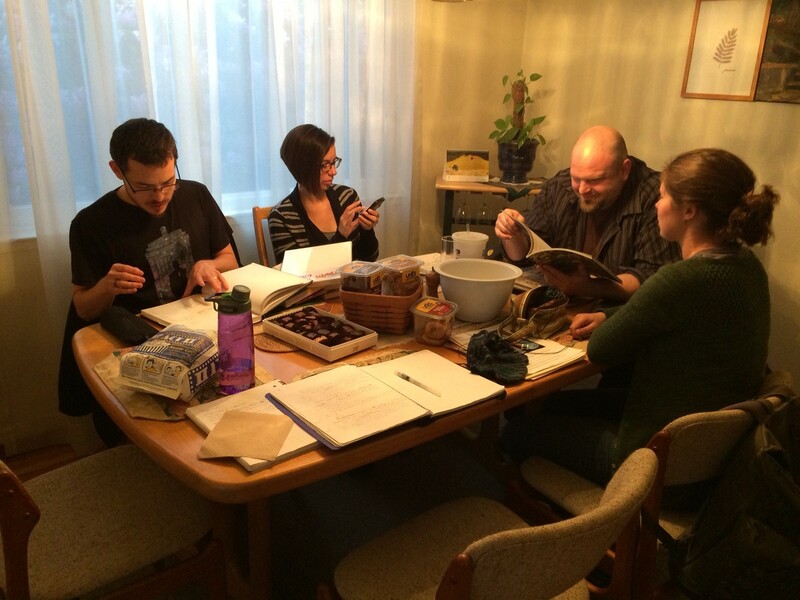 A calligraphy artist, a painter, a video game designer, a knitwear designer, and a writer sat around a table, ate cookies, talked about canvas stretching and fountain pen brands, made geeky jokes, and occasionally fell silent to be productive. Sometimes, it’s other people who refresh our own creativity. 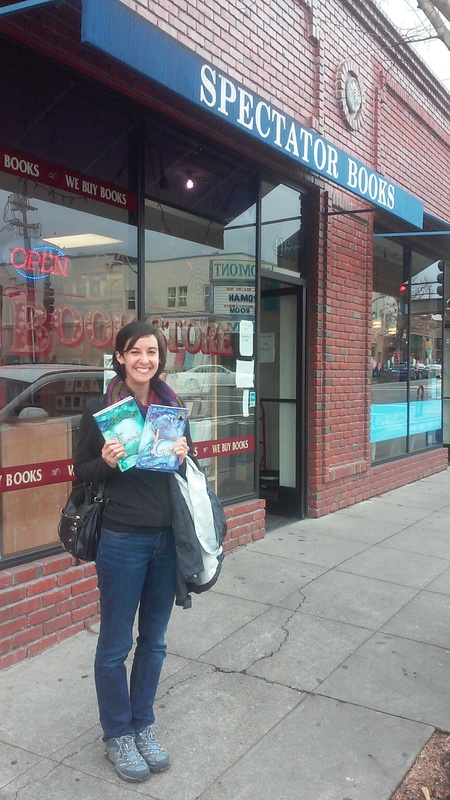 I have joined forces with my first bookstore! On a bohemian street offering boutiques, antiques, and handcrafted coffee, check out this independent bookstore that’s bigger on the inside. 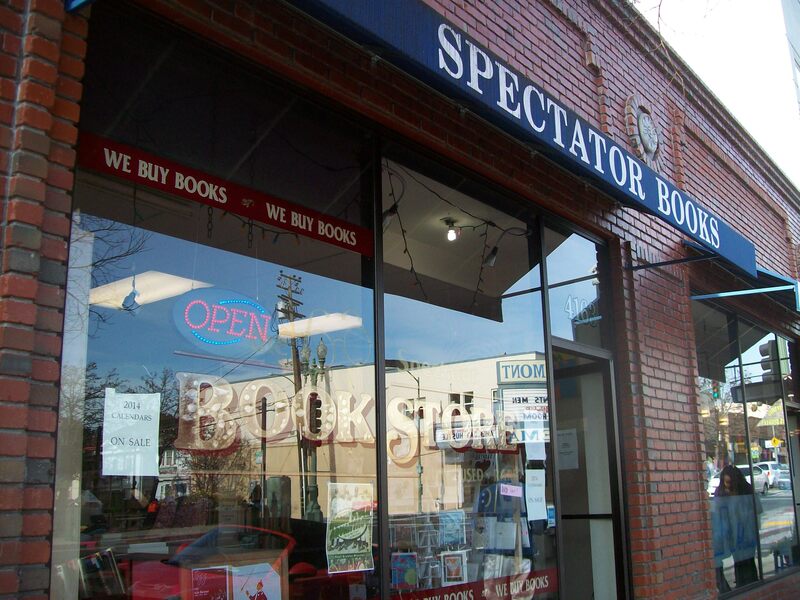 Spectator Books sells both used and new books. Their fiction selection (for both adults and children) is particularly impressive. 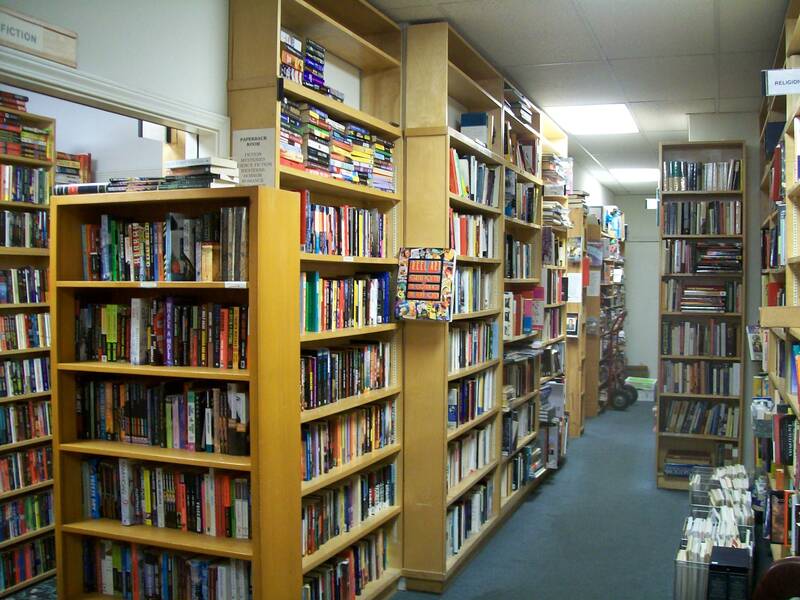 So if you find yourself in the area, get a little lost in this lovely labyrinth of books. And maybe pick up a certain title while you’re there (wink, wink).